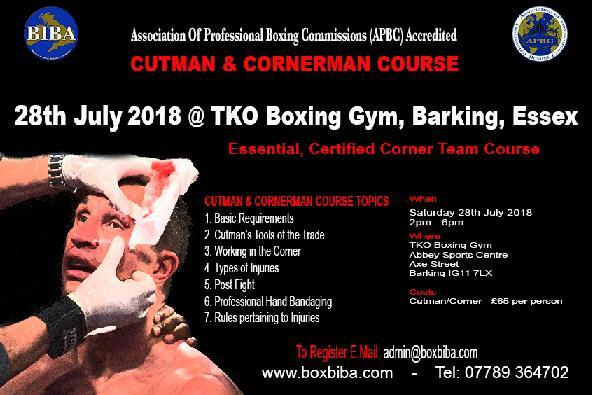 The British & Irish Boxing Authority (BIBA) have arranged a series of Association of Professional Boxing Commisions (APBC) accredited Cutman and Cornerman Courses. This particular course will take place at the TKO Boxing Gym in Barking on the East London/Essex Borders on Saturday 28th July 2018, with further courses taking place in the Midlands, Wales, Scotland and Northern Ireland later in the year. ALL Coaches are welcome regardless of licensing authority, as these courses are essential for all involved in our sport whether Pro, Amateur or Unlicensed.